Fossils discovered east of Africa's Lake Turkana confirm that there were two additional species of our genus—Homo—living alongside our direct human ancestral species, Homo erectus, almost two million years ago. The finds, announced in the journal Nature, include a face, a complete lower jaw, and part of a second lower jaw. The fossils were uncovered between 2007 and 2009 by the Koobi Fora Research Project (KFRP), led by Meave and Louise Leakey. NYU anthropology professor Susan Antón, a member of the research team, was part of the effort to compare these fossils with those from earlier finds. 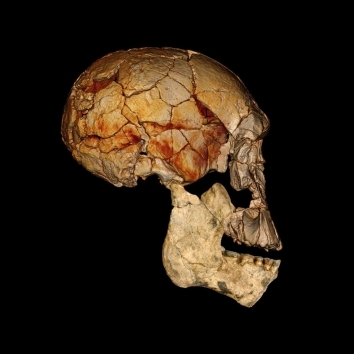 "These new fossils provide great tests of earlier hypotheses of how diverse the early Homo record was," explains Antón. "They provide anatomical support for the idea of multiple species of early Homo, but, more importantly, they suggest ideas about how the species might have divided up the environment—the species weren't separated into a large species and a small species; instead, the fossils suggest remarkable size variation within each species, but with different facial anatomies." Four decades ago, the KFRP discovered the enigmatic fossil known as KNM-ER 1470 ("1470" for short). This skull, distinguished by its large brain size and long flat face, ignited a longstanding debate about just how many different species of early Homo lived alongside Homo erectus during the Pleistocene epoch, which spanned from 2.6 million to 11,700 years ago. 1470's unusual morphology was attributed by some scientists to sexual differences and natural degrees of variation within a single species, whereas others interpreted the fossil as evidence of a separate species. "Combined, the three new fossils give a much clearer picture of what 1470 looked like," adds Fred Spoor, leader of the scientific analyses. "As a result, it is now clear that two species of early Homo lived alongside Homo erectus. The new fossils will greatly help in unraveling how our branch of human evolution first emerged and flourished almost two million years ago."